The Ontario Energy Board has a significant impact on what Ontario ratepayers are charged for energy. In recent years the cost of electricity has soared while the price of gas has not. Now the government whose intervention has cost Ontarians steeply is similarly threatening to micromanage the gas industry into escalating rates. Changes to Regulation 95/05 would be required to provide this kind of flexibility to develop options. Changes to the current regulation are needed to address [the] lack of consistency in the approach to recovery of [Global Adjustment] among Class B consumers. The document basically sets requirements that the OEB feels need to be met to allow it to experiment further on Ontario ratepayers. 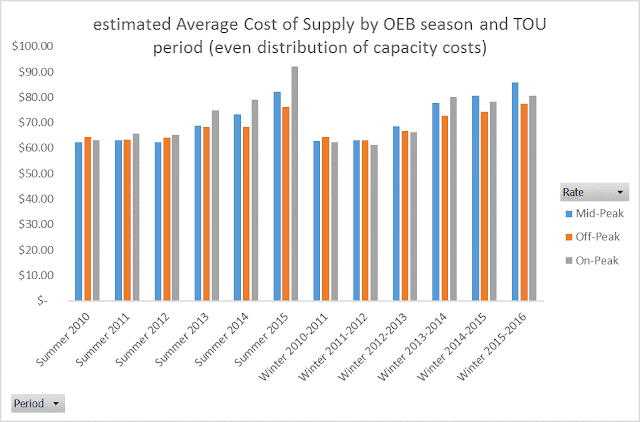 In 2015, the OEB made changes in the allocation of the costs of natural gas generators into the mid-peak and on-peak periods, reflecting the system purpose for which many of the facilities were initially contracted: ensuring reliability of supply and being a dispatchable source of power at times of higher demand. This change in allocation expanded the ratio between on and off peak prices providing greater rewards to consumers who shift use to evenings and weekends, and was a first step towards taking a longer term approach to system supply costs and efficiency. Lennox and what they are calling "Gas Contingency Support Payments", which I assume are referencing the Net Revenue Requirement contracts of natural gas generators, were not contracted specifically to meet peak demand periods. It makes little sense to not pay nuclear units to be available at peak but to pay gas generators to be available - something Ontario's system operator shows little understanding of either. It's a point that might be better made by a question: if a gas generator should be paid $30 each hour capacity is available to generate in the afternoon, and nothing in the wee hours of the morning, why would a nuclear generator's output not be worth $30 more in the afternoon than in the wee hours of the morning? The reality is those gas generators produce 50% of their output in Off-Peak hours during the peak, for them, winter season. Lennox is a dual-fueled facility that is essentially the system's emergency reserve. In an ideal world it would probably be funded by the generators it exists only to back up. Price spikes in Ontario are from the unexpected loss of a generator that is large (such as a nuclear unit), renewable energy forecasts that didn't come close to anticipating reality, and, very occasionally, a scarcity of natural gas supply. The large increase in some consumer segments are due to decreases, or small increases in others. Time-of-use is unrelated to any of these things, and the OEB no more needed 4 consultants to study up on things I wrote on 4 years ago (more forcefully early this year), than it needs to further pursue more studies. If the OEB were a medical professional it would be in the unpleasant position requiring it to call the TOU patient dead, and break the news as firmly as possible to it's demented mother. I don't know what type of professional the OEB is attempting to be in this report. ...an application and pre-filed evidence from Union Gas Limited ("Union") seeking approval of its proposed Community Expansion Program. The overall intent of this application is to support the expansion of infrastructure necessary to provide natural gas to communities that would otherwise not receive natural gas service. This application is in response to the Ontario Energy Board’s (“the Board”) invitation (dated February 18, 2015) to parties with the appropriate financial and technical expertise to submit proposals designed to facilitate enhanced access to natural gas for non-served rural and remote communities and businesses in the province. The Ontario government’s desire to expand natural gas distribution systems, which will increase natural gas use, is inconsistent with their recently announced intent to implement a cap and trade program whose objective is to significantly reduce the use of natural gas. While Union supports its Community Expansion proposals as filed in this application, the ultimate degree to which any approved regulatory flexibility is used will depend on reconciling these two opposing government policy positions. I'll paraphrase: we don't know what that crazy government is doing but here's a document you requested that says how we'd slide into the same consumer-hating trap as the electricity sector companies. The OEB is likely incapable of equitable distributing socially motivated charges across consumers. This is evident around Ottawa where the local distribution companies has long sought Hydro One's customers, which Hydro One has clung to as that lucrative market subsidizes their servicing of smaller areas. If Toronto's Premier wants to subsidize gas she should introduce a tax that promises to do that. The tax could be on gas. It is simple cowardice to hide the cost of her actions by fouling a mandate of the regulator. If the OEB is involved, it's purpose must be to get the rate impact on consumers who will see no benefit to the work down to $0. $0 is their job - lest we begin the next journey to a billion dollar waste. A nice coincidence after posting this is that I noted on my reader a new post by Severin Borenstein: If You Like Your Time-invariant Electricity Price, You Can Keep It. I quoted Broenstein's work years ago when first exploring, and blogging on time-of-use pricing. I'd characterize the economist as a fan of "time-variant" pricing - although the far more intelligent kind pricing scarcity, not hour of the day - but a realist in recognizing the savings for consumers aren't great and consumers should be allowed to pay more for the security of fixing rates and the comfort of using their light switch any time the feel they want light without doing the math first. If I were attempting to be fair to the OEB analysis, they could be given the regulatory freedom to allow users to opt out of time-of-use rates with an alternate rate plan providing a slight (4-5%) increase in the anticipated revenue. Most would not opt out - and the government wouldn't be such a thug enforcing pricing uniformity where it is neither desired nor wise.